If this doesn’t concern you, you may directly move on to the next part. Here are the steps I followed to install Ubuntu Server on each MinnowBoard MAX. First we need to create a Bootable drive from which to run the installer. Then it’s only following the installer’s instructions. Select “Ubuntu Server Installer” for the distribution. Select the .iso just recently downloaded in step 1. Select the USB Thumb Drive where to create the installer. Before running the installation plugging in our Thumb Drive, there is a problem that needs to be solved. The MinnowBoard only has 2 USB ports (1 x USB 2.0 + 1 x USB 3.0). However we need at least 3 of them for this process. Now we need a screen. The MinnowBoard has a Micro-HDMI port. If you have a screen that supports HDMI, then all you need is a “Micro-HDMI to HDMI” cable. Warning : However, if you have a screen which only has VGA, it’s a bit more difficult. I haven’t succeeded using my VGA-only screen. “Micro-HDMI to VGA” cables only exist as “Male to Female” adapters. I bought one. Didn’t work. Went back to the shop. Had it replaced with another model. Didn’t work either. Gave up. First, make sure one of the ports of the switch is connected to your home router, because the installer needs Internet access. Type “exit” and you enter a menu, where you choose “Boot Menu” and then a list of devices are displayed. Select “EFI USB Device” to run it. You are now running the Ubuntu Installer. Select Install Ubuntu, and follow the instructions. I turned to all the minimal choices (no libraries to install, no automatic updates) to keep my tiny computers simple and stable. I used the user “nico” during installation and I gave the following hostnames to my 5 nodes : ubuntu0, ubuntu1, … ubuntu4. Below is a screenshot of how I partitioned a 500GB HDD. 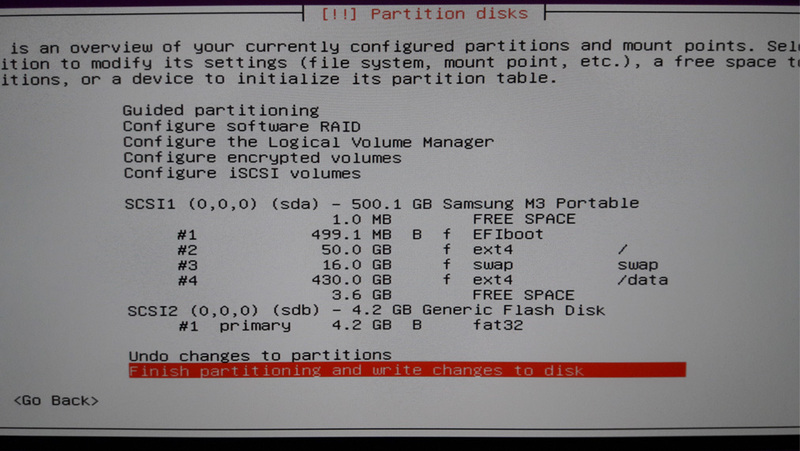 I kept a 50GB partition for the OS, and a larger 400+ GB partition for application data (Datasets, HDFS) usage. I used 16 GB of swap because with only 2 GB of RAM I was a bit paranoiac. My address is 192.168.0.4 and it was assigned by my router. On most home routers (like mine anyways), the IP address is assigned randomly at first, and then won’t change. So I guess you can use this IP Address as your host, write it down somewhere. However, if you have access to your router’s management UI, you can set a “static” IPs to your host by reserving an IPs for the given MAC Address. In addition to guaranteeing permanent IPs, this can improve readability. In my case, I have reserved the address “192.168.20x” with “x” being the host number, so it’s easy to memorize each host’s address. Now that you know your IP address you may do everything by distance through SSH, so you can disconnect the USB hub and the video cable, and move on to the installation of the next host. The only necessary connected device now is the external HDD (make sure it’s on the USB 3.0 port for best performance). I also installed an FTP server on each host. It’s not necessary for Hadoop or Spark but useful to transfer big data sets. After installation, I needed to edit the /etc/vsftpf.conf configuration file and uncomment write_enable=YES to enable sending files to the host. If you have too many hosts, or can’t set reserved IPs in your router, an alternative to defining everything statically in this file is to install a DNS server on one of the hosts. For this tiny cluster I only had 5 nodes so I didn’t bother to do that. Hadoop and Spark both run on Java, so our final task before making the cluster ready is to install Java. I chose to install Java 1.7.0_21 because it looked like the most stable Oracle JDK for Hadoop based on this Wiki. We can now install Hadoop and Spark.